Eight Bryan ISD students and two College Station ISD students are part of a computer-programming and robotics team called Zero Robotics at Sam Rayburn that is preparing for an international competition at the Johnson Space Center in Houston Friday. The competition includes a live stream with International Space Station astronauts who will allow the Rayburn Intermediate School team to see how their code that originated from regional winners Zero Robotics at Sam Rayburn and The Boys and Girls Club of Edinburg would perform on the space station. The Rayburn team qualified for the event by tying for first place with the Boys and Girls Club of Edinburg, TX in the Zero Robotics Regional Competition on July 27. The competition ranked team coding simulations created throughout July as part of a national contest designed by the Massachusetts Institute of Technology’s, MIT, Space Systems Laboratory. Zero Robotics is a program for middle school and high school students, consisting of a computer-programming competition where teams learn to program instruments called SPHERES. SPHERES were created by MIT for NASA research on the International Space Station. It was created in 2009 by the MIT Space Systems Laboratory and astronaut Greg Chamitoff with the goal of opening research on the space station to large groups of secondary school students. As teams from all over the world, including one from the Navajo Nation, one from Puerto Rico and two from Russia, completed in each round this summer, their coding results were sent to coordinators at MIT, which then ranked and posted the results. Additionally, the Rayburn team participated in space exploration research, worked on building and launching bottle rockets, toured the wind tunnels at Texas A&M University, and collaborated with other teams around the state, as well as personnel from MIT and Texas A&M. This was the first year for a team to be hosted at Rayburn Intermediate School, and the first year for Kayla Garner, Rayburn Intermediate fifth-grade math teacher, to coach. 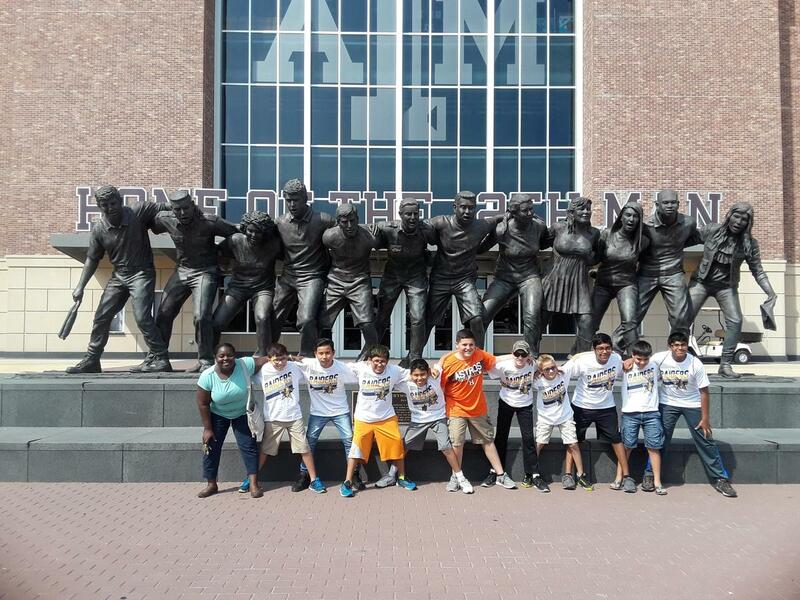 The Rayburn Intermediate team includes Garrett O’Banion, Caleb Heslip, Johnny Avila, Kaden Garcia, Juan Vazquez, Jaime Acosta, Gilbert Moreno, and Michael McKinley, all incoming 6th graders at Bryan ISD, as well as Shashan Fernando and Debarghya Chaki incoming 8th graders at College Station ISD. 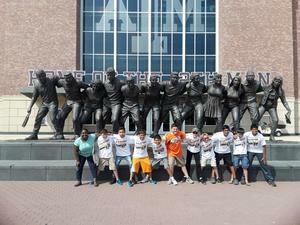 Photo: Kayla Garner and The Zero Robotics at Sam Rayburn team in front of Kyle Field.